My students are rising to the occasion. They never encountered the following type of problem before but by the second day they were becoming masters of the universe. In which order did he use the fractions so that he was left with just one peanut at the end? This task is the second in a series of three. I wanted to give the students a challenge while practicing multiplying fractions, but I also wanted the problem to be approachable. Frankly I think it would have been a disaster had I not introduced the tree diagram the previous day. While in previous years students had used tree diagrams for an occasional probability problem that approach was the farthest thing from their minds. 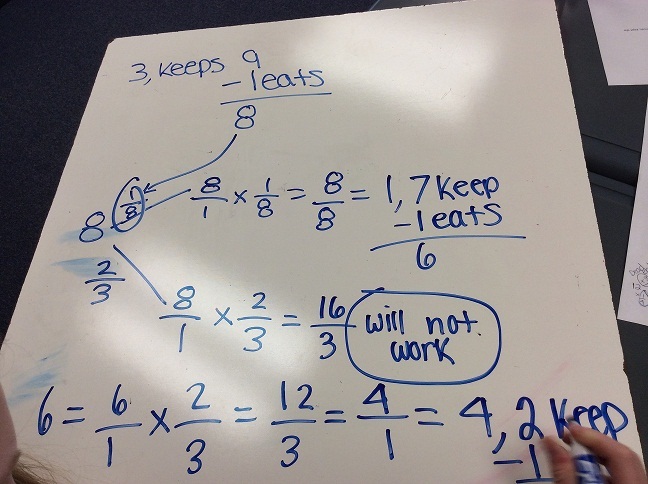 My goals for the lesson were to practice multiplication of fractions while using the diagram to organize their work. As they became more comfortable with the tree diagram student work became more systematic. That freed up their brains to concentrate on what is happening with the fractional amount. Several groups needed to be reminded that the elephant gives away that amount, which means he keeps the rest, then eats one. One student, Jeff, had missed the previous day’s lesson where I introduced the students to a simpler version of the problem involving only two fractions. On Monday, groups will tackle the third peanut task with minimal oversight. Those who finish early will work to create their own peanut task. I want you to know that the inspiration for these problems was provided by the Peaches Today, Peaches Tomorrow task on the NRICH website. Part 2 of the series captivated me, yet I thought dealing with 6 fractions in a 41 minute period would be too much for my seventh graders. Designing these problems was a collaborative effort and I want to thank my colleagues for their help in creating a meaningful twist to the problem (give away instead of keep).